On Tuesday, November 8, the world as we know it changed. An overdrawn and largely insane election season came to an end. We now have closure on many big things, and while parts of this closure are clearly ominous for many Americans, other parts provided a sense of excitement, anticipation. I’m not talking about Donald Trump — I’m talking about marijuana. Yes, while Donald Trump’s “shocking” victory has been broadcasted in bulk at high volumes, there’s also been big news in the arena of marijuana reform. Before Tuesday, recreational marijuana was legal in four states: Washington, Colorado, Oregon, and Alaska, as well as the District of Columbia. Four more states have now been added to that list, as citizens of Nevada, California, Massachusetts, and Maine voted to pass legalization measures. And that’s just recreational marijuana. Medical measures were also approved in North Dakota, Arkansas, and Florida. Now, over half of the states in America have approved marijuana for medicinal use. Legal pot is coast to coast, and three of our nation’s four corners now allow people to use the drug recreationally. The times they are a-changin’. A fifth state also voted for the legalization of recreational marijuana — Arizona — but votes fell just short of passing their measures. Also dipping their toes in the waters of medical marijuana legalization was Montana, which didn’t join Arkansas, Florida, and North Dakota in legalizing medical marijuana, but did pass a measure to lift restrictions on providers. For advocates of legalized marijuana, Tuesday was a victory nonetheless. Medical marijuana essentially experienced a clean sweep. As for recreational pot, four outta five certainly ain’t bad. First of all, there’s California. People probably think this one was a long time coming. It makes since, considering the rest of the west coast had already legalized recreational pot, and California is… well, California. I’ve definitely spoken with people who were surprised to learn that recreational marijuana wasn’t already legal there. To be fair, medical marijuana has been legal in the state since 1996, when California became to first state to pass such legislation. Under the new laws, folks in California who are over the age of 21 will be able to purchase and use marijuana recreationally. It’ll come with a 15% sales tax and those who grow it will also pay a cultivation tax — money that will go toward research and law enforcement. Nevada’s recreational marijuana will also be available to adults over the age of 21. That’s something you’re going to see across the board. Like California, pot will be taxed at 15%, and this money will be used to fund regulation efforts and support the education system. People will even be allowed to grow their own plants for personal use, as long as they grow it in a locked enclosure. Medical marijuana has been legal in this state since 2000. Moving over to the east coast, where recreational marijuana has up till this moment been legal nowhere, there’s Massachusetts. Although this state, like every other state in the eastern U.S., hadn’t legalized the drug for recreational use prior to election day, their legislation wasn’t terribly restrictive. Medical marijuana has been legal here since 2012 and decriminalization measures went through in 2008. Citizens of Massachusetts will also be allowed to grow pot for personal use. Eligible users (by which I mean people over the age of 21) will have clearance to grow up to six plants, have ten ounces at home, and carry a maximum of one ounce in public. There’s been some arguing over how marijuana should now be taxed, but as of now, Massachusetts is looking at a 12% rate. Now for Maine: the closest call of all the states with newly legal recreational pot. This one was to close to call at first, but the votes finally came in and recreational marijuana scored a victory by the skin of its teeth. Like every other pot-legal state, the age for comsumption is 21 or older. Maine has a lower sales tax than the rest, though — a mere 10%, which is especially tiny compared to, say, Washington, with its 37% tax rate. Pot has been legal in Maine (for medical uses) since 1999 and this is the first successful campaign to legalize the drug for recreational use. This money will go to a “general fund” to be used for perhaps generally everything. It’s worth pointing out that Maine’s governor is against legal pot and has warned everybody that this will end poorly. We’ll see. Among the states who legalized pot on Tuesday, California probably boasts their measures as the biggest deal. Why? Because California is friggin huge. Its own economy rivals that of other developed nations, state by state comparisons aside. And now it’s looking like their marijuana industry might even outpace their wine industry, which is, you know, what California’s kind of known for. California’s legalization of recreational pot will also further complicate the already super weird discrepancy between state and federal law. Now eight states have legal pot, in spite of our federal law, which contends that marijuana is as illegal as heroin. The pressure was already on to change this — as pro-legalization advocates often assert, there’s no way that pot is as dangerous as heroin, or that it’s more dangerous than alcohol. So now there will surely be more pressure. In a Trump administration, who knows what will happen. The Donald himself has made it clear that he thinks legalization should be left up to individual states, and besides, he’s got other issues on his agenda that are much more contentious and pressing. Then there’s the fact that many within his party are strongly against legalization, like Chris Christie. 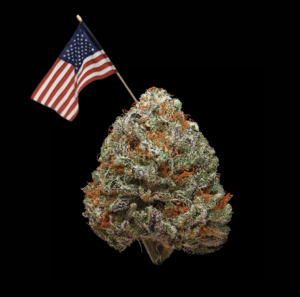 Depending on who finds themselves in top positions in the New White House, the future of marijuana could go either way. But for now, however one looks at it, legalization efforts are gaining some very substantial ground.